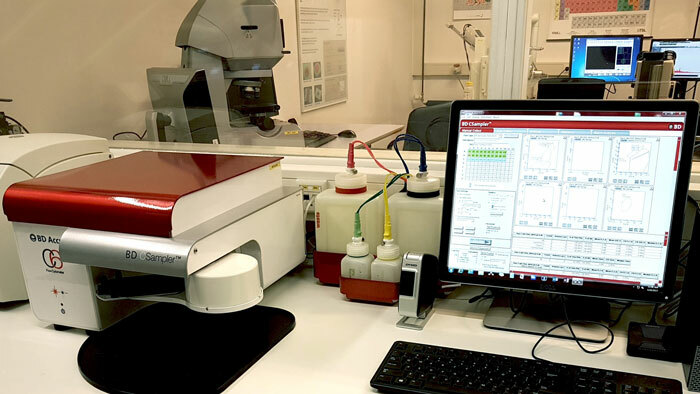 Quaker Chemical Corporation has partnered with the faculty of Veterinary Medicine at the University of Gent to develop a new tool to accurately evaluate and predict a metalworking fluid’s antibacterial capacity. One of the major problems in the metalworking fluid industry is bacterial growth; however, a fast yet accurate method to evaluate and predict the fluid’s antibacterial capacity is currently lacking. The test method is based on flow cytometry to assess the antibacterial potential of newly developed cutting fluids independent of bacterial growth. Results of this novel method were compared to a bio-challenge test currently used in the metalworking industry and also to traditional plate counts. The results represent a proof-of-principle that flow cytometry can reliably predict the antibacterial capacity of metalworking fluids within one day of incubation with Escherichia coli, Klebsiella pneumoniae, Pseudomonas aeruginosa and Proteus mirabilis. This is substantially faster than the current growth-based methods, which can take up to eight weeks. “New regulations restrict the use of certain biocides and the market demands us to find alternative chemistries. This new technique, flow cytometry, has been instrumental in the development of our boron-free and formaldehyde-free product portfolio. It allows us to dramatically speed up development work, while offering more flexibility in the choice for microorganisms in our studies. It delivers quantitative data, which allows us to employ statistical techniques in optimizing the chemistry in our formulations. This really is a huge step forward,” said Fred Hoogendoorn, a research scientist at Quaker Chemical. Quaker Chemical, headquartered in Conshohocken, Pennsylvania, U.S.A., is a leading global provider of process fluids, chemical specialties, and technical expertise to a wide range of industries, including steel, aluminum, automotive, mining, aerospace, tube and pipe, cans, and others.